Citation: Naumov MM (2018) Oscillation Energy of Plant Biological Time in Ontogenesis. Sch J Appl Sci Res. Vol: 1, Issu: 5(44-51). Copyright: © 2018 Naumov MM. This is an open-access article distributed under the terms of the Creative Commons Attribution License, which permits unrestricted use, distribution, and reproduction in any medium, provided the original author and source are credited. Background: Research objective - to calculate energy of oscillation of biological time of plant in ontogenesis under the influence of weather environment. At the same time, the simplest model of system for the first calculation is taken. Methods and Findings: Biological time is represented in the form of the dependence on photosynthesis and respiration processes of the whole plant organism via СО2 exchange. Two-dimensional temporal space is implemented naturally. Consideration is given to the issue of biological time oscillations during plant ontogenesis. It is believed that lowering the air temperature from the optimum level down to the actual temperature would deviate the biological temporal vector from the physical time axis. The time change is deemed to be an integral of the scalar product of the biological temporal vector with the physical time axis. The flow rate of biological time is determined by the rate of CO2 exchange for the whole plant depending on the state of environmental factors (photosynthetic active radiation (PAR), air temperature, and productive soil moisture). Oscillations of the newly obtained normalized logistic curve of plant growth are assigned to those of the whole plant biological time. Conclusions: The potential and kinetic oscillation energy of biological time of the whole sunflower plant during ontogenesis is calculated subject to the condition of environmental factors. The plant organism is considered as a simplified system or a conservative system. Development, Energy, Growth, Photosynthesis, Respiration, Time. We cannot see time, even with the strongest microscope. We can only study events and processes and compare time intervals to them. In this paper, we will study time with respect to the photosynthesis and respiration processes of plants, the plant growth processes, and the total dry plant biomass value. It is known that the duration of plant ontogenesis is not a constant value relative to the physical (calendar) time axis. Thus, for example, the duration of sunflower ontogenesis in the south of Ukraine varies from 80 to 120 days. That is, biological time (simply, the time) tends to expand and compress depending on environmental factors [1-4]. This is an expression for two types of energy. As is customary in physics, it speaks of kinetic energy and potential energy. where A - is a constant equal to the sum of the effective temperatures over the inter-phase development period, °С; to sr is the average air temperature for the inter-phase development period, in °С; В is the lower limit of temperature for plant development, in °С; and n is the number of days in the inter-phase development period. where j is the number of days of the development period and tos is the sum of the effective temperatures for the interphase development period, in °С. Thus, the time under this method is measured in Celsius degrees instead of in true time units. 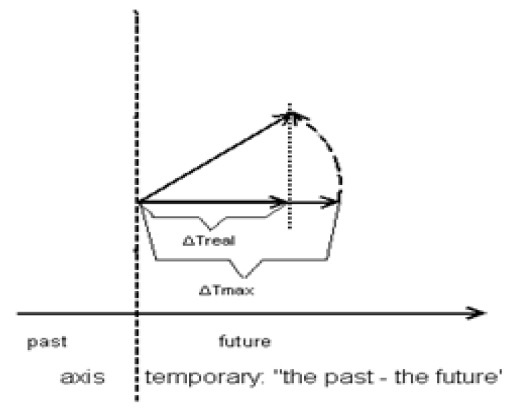 To move toward real time, we will perform the following operation: by the time the sum of effective temperatures for the inter-phase development period tos has passed (this can also be one from “shoots” to “at full maturity of seed”), equal to A, it is considered that the development phase has occurred. We divide the right and the left sides of equation (2.3) by the sum of the effective temperatures equal to A, in °С. This means that we have normalized the sum of the effective temperatures. Now this sum is expressed by an analogue, which varies from 0 to 1 of the real time. The effective temperature of the current day of calculation, Δto d, will also be expressed in relative units. This value corresponds to one day of physical (calendar) time. Thus, we have moved from the sum of effective temperatures method to the normalized real physical time. During the entire ontogenesis period, the time varies from some small t0 up to 1 (from the “shoots” event to “at full maturity of seed”). The normalized physical time also depends on the average air temperature for the current day of calculation (equation (2.2)). Let us consider the elementary increment of the normalized real physical time for one day of calculation (2.2) under the sum of effective temperatures method. This increment of physical time depends on the average air temperature for the current day of calculation. Thus, if the air temperature is optimal (for example, 25 °С average air temperature of the settlement period for the sunflower), then the increment of the normalized physical time will be the largest, maximum ΔTmax= max. If the average air temperature for the current day of calculation dropped to a biological minimum temperature В = 10 °С (for sunflowers), then the increment of the normalized real physical time would be zero. That is, we can imagine that the temporal vector deviates from its normal position, the physical time axis. Such a physical time axis has a direction - from the past to the future. Then, the projection of this deviating vector onto the normal physical time axis will give a real time increment ΔTreal, Figure 1. Deviation of the maximum temporal vector ΔTmax under the sum of effective temperatures method from the normal physical time axis when the average daily air temperature for the current day of calculation has lowered from the optimal average daily air temperature down to the real one. Figure 1: Deviation of the maximum temporal vector ΔTmax under the sum of effective temperatures method from the normal physical time axis when the average daily air temperature for the current day of calculation has lowered from the optimal average daily air temperature down to the real one. where T is the value of the real normalized biological time, in relative units; (F, dτ) is the scalar product of the deviation of the real biological temporal vector from the physical time axis; dτ is the vector ΔTmax when it tends toward infinitesimal; F is the deviating vector ΔTmax at the angle α when the average daily air temperature lowers from the optimal temperature to the real one; and τb and τe are the starting point (“shoots”) and the end point (“at full maturity of seed”) of the biological time curve, respectively. Here, the total СО2 exchange in the plant determines the increments and growth of the normalized total dry biomass, where t0 is the moment of growth beginning, and 1 is the moment of growth completion, that is, from the shoots event to the at full maturity of seed event. This equation shows the change in the growth rate of the normalized total dry biomass of the whole plant and depends entirely on the current state of the environmental factors such as PAR, heat, productive soil moisture, nutrition, СО2 content in the air and other unconsidered factors. It should be mentioned that some of the factors influencing the growth processes of the normalized total dry biomass of the whole plant in equation (2.16) have not been considered yet. Here, as well, we have not considered the effects of environmental factors on the second derivative of the normalized growth rate of the logistic curve. Thus, equations (2.18) (2.19), and (2.20) describe the biological time oscillations of the whole organism, regardless of the current condition of environmental factors in the normalized form. These equations describe the genetic features of plants in relative time units, where during the entire ontogenesis, the physical time t varies from some small value (for the shoots event) t0 to 1 (for the at full maturity of seed event). Now we can compute the kinetic and potential energy of biological time oscillations T in plant ontogenesis in relative units with equation (1.4). The equation of the kinetic energy of biological time oscillations of the whole plant (2.22) has three terms: the first two are dynamic, ontogenesis time-dependent and responsible for addition of two harmonic oscillations of biological time in ontogenesis, and the third one is a constant responsible for positive values of kinetic energy. The constant of kinetic energy i should say that the vital processes permanently occur. where CV is the constant of integration, a constant of potential energy of the biological time oscillations. 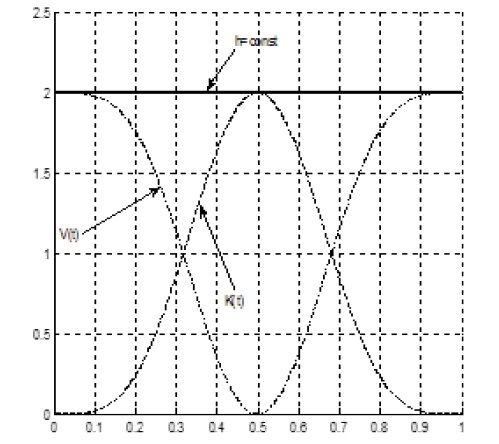 The constant value of potential energy CV shall be such that the potential energy V (t) is always positive and equal to zero in the minimum point. Such a constant was found by the potential energy curve fitting method with calculations on PC in the MATLAB system. Then, the constant of integration of the potential energy of the biological time oscillations of the whole plant, regardless of the current condition of environmental factors is CV= 5/4. Now, we can figure the kinetic and potential energy of the biological time oscillations of the whole plant, regardless of the current condition of environmental factors in relative units during ontogenesis, Figure 2. Change in the kinetic K (t), potential V (t) and the total energy h = const of the biological time oscillations of the whole plant organism during ontogenesis, in relative units. Figure 2: Change in the kinetic K (t), potential V (t) and the total energy h = const of the biological time oscillations of the whole plant organism during ontogenesis, in relative units. As seen at Figure 2, the kinetic energy of the biological time oscillations of the whole organism at the beginning and the end of growth takes a zero value. Halfway through the plant growth, at the middle point of ontogenesis t = 0.5, the kinetic energy of the biological time oscillations takes the maximum value K (t) = max. The potential energy V (t) at the beginning and at the end of growth has a maximum value. The potential energy of the biological time oscillations at the end of ontogenesis, at the at full maturity of seed event, is fully stored in the reproductive organs, the plant seeds (in sunflower seeds). Similarly, we can note that the potential energy of the biological time oscillations at the beginning of growth, at the sowing event, is entirely contained in the plant (sunflower) seeds, and for the shoots event, it has some lower value, as potential energy has been spent on the growth and development of the plant organism. The total energy of the biological time oscillations of the whole plant in accordance with the energy conservation law for a conservative system always remains constant: h = K (t) + V (t) = const. Now let us examine the change in the kinetic and potential energy of the biological time oscillations of the whole plant under real ontogenesis. To do this, we take the sunflower that used to grow in the real conditions of the Odessa region, Chernomorka village in 1986. Example of calculating the potential and kinetic energy of biological time oscillations of the whole sunflower plant in a real environment in 1986. For the calculation, we will follow the following pattern. First, we calculate the tension level of environmental factors (PAR, heat, productive soil moisture) for every day of ontogenesis. To do this, we take the average decade data and assume that during the given calculation decade of growth and development of the sunflower, the values of PAR, average daily air temperature, and productive moisture reserves within a 1-meter-deep soil layer were at the same level. We assume that the level of soil nutrition was optimal. The CO2 content in the air corresponds to the normal level. Then, we calculate the change in the normalized physical time t with respect to the calendar time j. Next, we calculate the growth rate of the total dry biomass of the whole sunflower plant in real environmental conditions, taking into account the current environmental factors. Then, we calculate the real dynamics of the total dry sunflower plant biomass during ontogenesis and compare it with the measured values of the total dry biomass in 1986. Further, we will require the final calculated value of the total dry sunflower plant biomass. Then, we will normalize the growth rate of the total dry sunflower plant biomass to obtain the normalized values of the plant biological time T. Finally, we calculate the kinetic and potential energy of the biological time oscillations of the sunflower plant under the real environmental conditions of 1986.
where j is the day number in ontogenesis (from the shoots event to the at full maturity of seed event), in calendar time; χlight(j) is the exponential normalized light curve for the photosynthesis rate of sunflower culture, in relative units; Iopt is the optimal PAR flow at the upper sunflower sowing limit for the growth and photosynthesis processes to run at maximum rate, Iopt= 650 W·m-2; IS(j) is the normalized real PAR flow at the upper sowing limit, in relative units; Ci is the light curve parameter which, along with value Iopt, determines the degree of the light curve inflection, Ci=0.01 m-2·W-1; λwarmly(j) is the normalized temperature curve parabola for the growth and photosynthesis of sunflower culture, in relative units; to opt is the optimal average daily air temperature for the growth and photosynthesis processes of sunflower culture, to opt=25 °С; to r(j) is the normalized real average daily air temperature within the sowing period, in relative units; at is the temperature curve parameter which, along with value topt, determines the critical points for the growth and photosynthesis processes of sunflower culture to occur, at =0.0022 °С-2; γmoisture(j) is the normalized moisture curve parabola for the growth and photosynthesis of sunflower culture, in relative units; Wopt is the optimal reserve of productive moisture within a 1 meter-deep soil layer for the processes of growth and photosynthesis to occur, which for the Odessa region, Chernomorka village is Wopt = 131.9 mm; WS(j) is the normalized real reserve of productive moisture within a 1 meter-deep soil layer, in relative units; and aw is a parameter of the moisture curve for the growth and photosynthesis of sunflower culture which, along with value Wopt, determines the critical points for the photosynthesis process to occur, aw =0.00004 mm-2. where IPAR(j) is the PAR flow at the upper sowing limit, W·m-2; SS (j) is the duration of sunshine hours per day, in hrs; (a + b)=sinh0(j), where: h0(j) is the Sun’s midday height; and τday(j) is the length of daylight hours, in hrs. where tair(j) is the current average daily air temperature, in °С and Wstocks(j) is the current reserve of productive moisture within a 1-meter-deep soil layer, in mm. where j is the day number in ontogenesis from the shoots event to the at full maturity of seed event; t0 is the initial value of the normalized physical time axis (for the shoots event), in relative units: t0= 0.01; t (j) is the normalized value of the physical time axis, which depends on the day number in ontogenesis j, in relative units: t0 ≤ t ≤ 1; Δtopt is a constant related to the maximum development rate for optimal values of environmental factors, for sunflowers: Δtopt= 0.0097 relative physical normalized time units ∙ day-1. To calculate the optimal rate of the plant development, Δtopt (sunflower), it is necessary to take the average long-term value for the duration of the shoots-to-at full maturity of seed period of development. For example, let us assume the duration of this period of development to be 103 days. Then, the value Δtopt will be calculated from Δtopt= 1/103 = 0.0097 relative units of the normalized physical time per day. Equations for calculating the normalized physical time axis t were obtained and verified in literature [16,17]. According to those studies, the moment when the relative time axis t (j) is equal to 0.5 corresponds to the blossoming event of the sunflower. where Mreal(j) is the real total dry biomass of the whole sunflower plant, g ∙ plant-1 and Δ M max Δt is the maximum growth rate of the total dry biomass of the whole sunflower plant for one day of calendar time j in optimal environmental conditions, here Δt = 1 day, g∙plant-1∙day-1. The maximum growth rate is observed in the middle of ontogenesis and is equal to Δ M max Δt =12.1 g∙plant-1∙day-1 (this value was obtained by the author as a result of experimental observations of sunflower sowing in the village of Chernomorka in 1986 and numerical experiments on a PC in the MATLAB system). Integrating equation (3.11) for every current day of calculation, from the shoots event to the at full maturity of seed event, we obtain the value of the final total dry biomass of the whole sunflower plant, which amounts to the value Mfinal = 924.6 g ∙ plant-1, Figure 3. The plot of the obtained kinetic energy of biological time oscillations of the sunflower plant grown in 1986 in the Odessa region, Chernomorka village is presented at Figure 4.
where Kmax (1986) is the maximum value of the kinetic energy under the growing conditions of sunflower culture in 1986 in the Chernomorka village, which is Kmax(1986) =2.0092∙10-4 day-2. The plot of the obtained potential energy of biological time oscillations of sunflower plant organism is shown in Figure 4. According to our data on sunflower growing in 1986, the blossoming event for sunflowers occurred on the 63rd day from the shoots event, which corresponds to the maximum kinetic energy of the biological time oscillations of the sunflower plant in ontogenesis. The same blossoming event for the sunflower corresponds to the minimum potential energy of the biological time oscillations of the sunflower plant. We started this study with the analysis of the sum of effective temperatures method (degree-days) and came to the conclusion that the rate of plant development depends on the processes of photosynthesis and respiration of the culture, or on the CO2 exchange of the whole plant. At the same time, one can consider abstract intervals of time, not just the sum of effective temperatures method. If we assume that the time inside the plant expands and compresses linearly depending on the environmental factors, we will obtain the same conclusions based on the fact that the temporal vector rotates around the point of the current moment of ontogenesis. We calculated the projection of the deviating temporal vector onto the physical time axis. As a result, the biological time was calculated using the integration of the scalar product of two temporal vectors. This means that we obtained the meaning of work in the physical sense of the word, which produces time. It is known that the rate of plant development is determined by the factors of heat, productive soil moisture, light, and plant nutrition. In our case, we have obtained that the rate of change of the biological time T is entirely determined by the total CO2 exchange of the culture, which in turn is determined by the factors of light, heat, productive soil moisture, nutrition and other unconsidered factors. For example, changing the content of CO2 in the air affects the rate of development. This equation can be regarded as the effect of the driving force of physical time t on the harmonic oscillations of biological time T(t). At the same time, it is known that the processes of photosynthesis and respiration of a plant, first of all, depend on incoming light waves (PAR). Therefore, the equation of the harmonic oscillations of biological time must be matched to the oscillations of light waves.